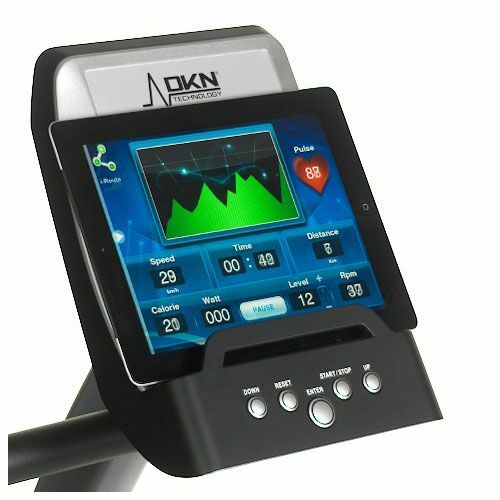 Over the years, Belgium based DKN Fitness have built a reputation for consistently producing affordable, high quality and high specification fitness equipment. 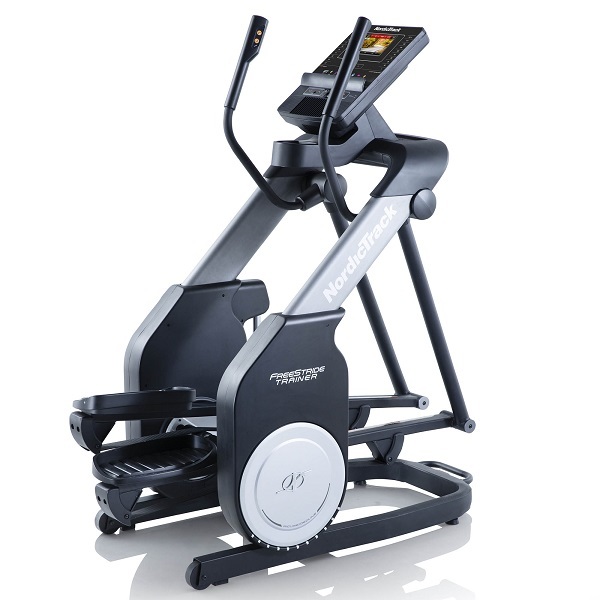 The XC-140i is the new version of the rather successful XC-140 cross-trainer and we’re eager to know whether the sequel will outshine the original or disappoint. Let’s find out the score!…. Assembly is a simple and fairly speedy 6-step process. With that done, the machine was ready for inspection….and we really couldn’t find one solitary thing to fault with its appearance. It has a glossy white and silver colour scheme with sleek and stylish lines giving the same first impression that it costs a fair bit more than it actually does! That’ a tick in the box for its looks but how does it fare in action? Performance-wise it’s actually a lot like the initial impression we got at first sight – perhaps best described as ‘nice’! DKN are sticklers for using high quality components wherever possible and it’s evident by the smoothness of the elliptical motion as the 14kg flywheel revolves. As we mentioned earlier, DKN generally use the best quality materials and parts that budget will allow. It’s not just in the smoothness of the motion that this becomes apparent – it’s evident from the moment you take hold of the handles and climb aboard. The stability and solidity of the machine reassures you that it’s been built to last, plus the maximum user capacity of over 22 stones and a 2 year warranty on parts and labour are also testament to that great build quality. The XC-140i has a 16” stride length which DKN state on their website as being “suitable for users who are up to 6 ft (1.83cm) tall.” It’s a rare occurrence that a manufacturer would err on the side of modesty with their claims but we think DKN may be selling the XC-140i a little ‘short’ here! Our chief reviewer (Charlie Rawes) is 6’2” tall and found the movement to be perfectly designed for the larger user. 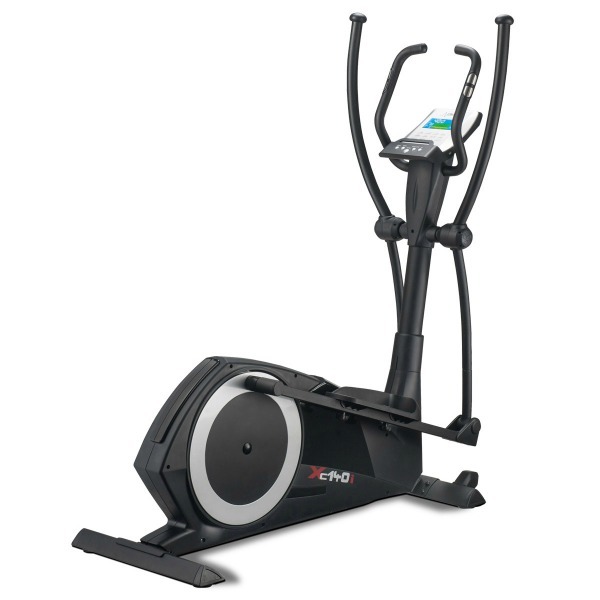 The XC-140i also includes adjustable footplates that slightly alter the stride length. The footplates have a bolt front and back that corresponds to the 3 pairs of holes spaced on the machine. By undoing the nuts under the footplates you can then lift the footplates up and out and drop the bolts into a different corresponding set of holes to alter the spacing (you have the choice of three positions). Having to go through the process of undoing nuts and washers and then putting them back on (upside down under the footplates) is certainly not something you’d relish doing too often but it’s a nice feature to have for a bit of fine-tuning and it goes to prove that the XC-140i should be ideal for many different body shapes and sizes too. At this price point it would be unrealistic to expect the actual ‘angle’ of the footplates to be adjustable (That is a feature you may find on models costing two or three times the price of the XC-140i). Therefore the angle that the footplates are fixed at is critical to the overall safety and comfort of your joints. 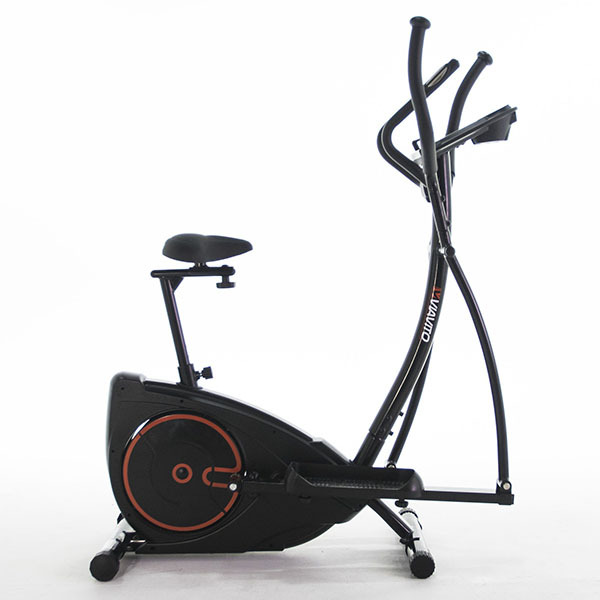 Here is where we applaud one of the greatest accomplishments DKN have achieved in the design of this model – throughout the elliptical motion the pedals remained at an angle that seemed to cradle the feet with reassuring security and comfort. In short they’ve got it right! 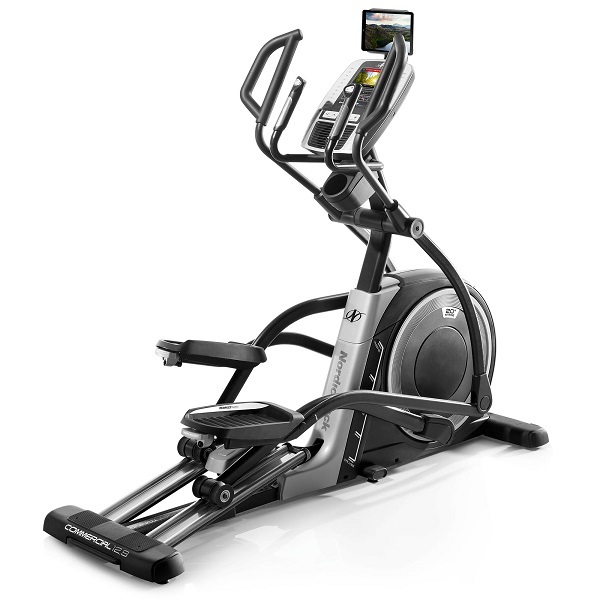 With a well-designed elliptical trainer, you should feel the stress being placed on the muscles of the lower body rather than the joints – and with the XC-140i you certainly do! AND with 32 levels of computer-controlled resistance, you REALLY can feel it too!! 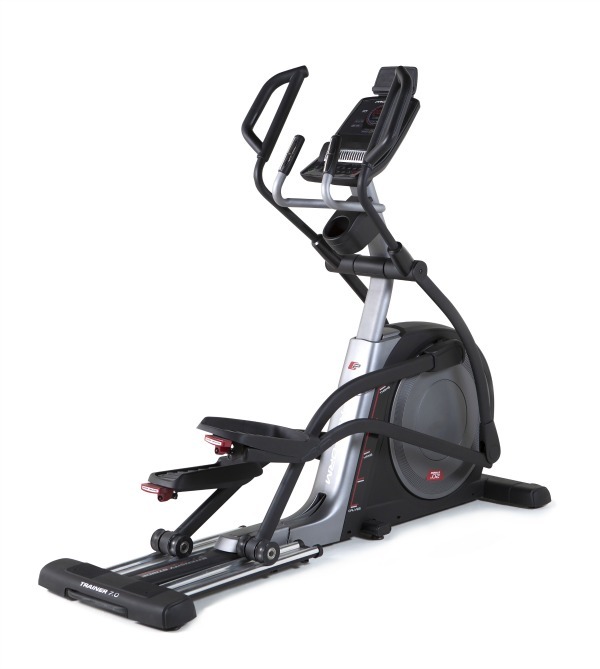 Of course, it’s not all about those leg muscles; the benefit of an elliptical with dynamic handles is that it offers a TOTAL body workout! The way the moving handles coped with the added stress of our reviewer making sudden directional changes in stride (from forwards to backwards) showed that they were as substantial and durable as their thickness suggested. Instead of the usual ‘straight up and down’ static handles typically found on most models, the fixed handles on the XC-140i are shaped to curve over at the top allowing you various different hand placements should you not wish to utilise the pulse grip sensors. The console has an inbuilt heart rate receiver, so if you have the use of a chest strap transmitter you have the freedom of choice to hold wherever you wish, as well as enjoy heart rate controlled programming. With regards to other programs, there’s a varied selection of a dozen pre-set courses. It’s a nice touch that the entire menu of these profiles is clearly printed on the console for easy reference. 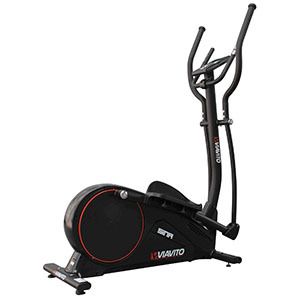 There is also a manual (target time, distance and calories where you control the resistance) and watts program too. Plus every option is easy to set-up thanks to an intuitive layout and a visually clear and appealing display screen. Your training data is set out in sections around the sides and across the top of the screen. The time display and pulse readouts are given extra space for clarity and the largest section in the lower middle of the screen shows the program selected with the profile or intensity levels made up by strips of vibrant green blocks. Perhaps it would have also have been nice to have a water bottle holder somewhere, however DKN have made up for this by treating us to a magazine or tablet holder instead. The buttons on the console are mounted onto a raised ledge, which would be a handy perch for your reading matter or your iPad. Now, this is where the little ‘i’ in the XC-140i model name is hiding a rather amazing feature. 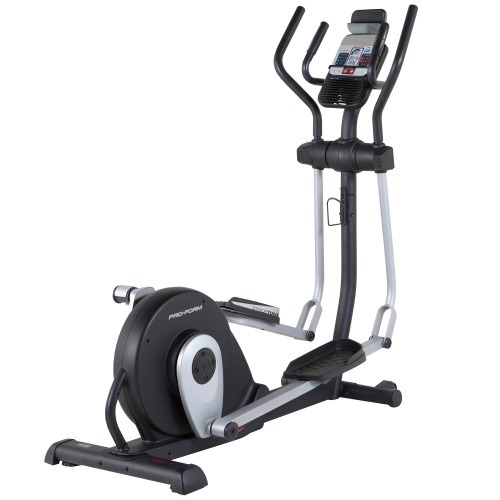 This elliptical trainer is compatible with most iPad and Android tablets and can establish a Bluetooth connection with a tablet placed on top of the console. An app called DKN Motion is available for free download from iTunes or the Google play store and with this installed, your tablet is transformed into a seriously amazing console for the XC-140i! All of the programs available through the use of the normal console are available on the DKN Motion app, but many are further enhanced. For example, as standard, the console has the facility to store the age, gender, weight and height of 4 users in order to provide more accurate calorie consumption feedback during exercise. With DKN Motion, this number is increased to 12 and each profile can additionally have a cartoon style avatar. We can confirm that using a tablet with its high resolution touch screen as a fitness machine console is an absolute pleasure. The app’s graphics have been well designed and the navigation to the different functions is very intuitive using standard touch and swipe gestures. One particular feature of the DKN Motion app that is worthy of being highlighted is the iRoutes feature. With this, the user is provided a selection of iconic routes from around the world and selecting one results in a cartoon style map of the route being displayed with the a pointer showing progress being made along the route whilst exercising. 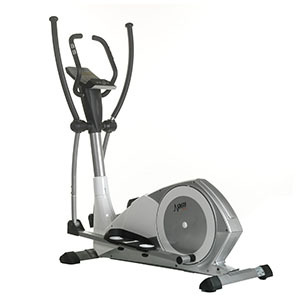 The resistance of the elliptical trainer is automatically changed along to reflect the gradients along the route. Another aspect of DKN Motion we liked was the facility to store exercise data against a selected user profile. Once you finish an exercise session, you’re asking if you want to save the data and once done, you can see how this session compared in key metrics such as exercise time and calorie burn with up to 9 previous sessions. If space is an issue, this model is surprisingly maneuverable. The plastic ‘feet’ that slip over the ends of the rear cross support, raise the base up enough for you to fit your fingers under and lift the rear of the machine so that it can be rolled along on the transport wheels at the front of the machine. Aside from those features mentioned, there really isn’t too much in the way of ‘extras’ and in our experience of equipment manufacture, we deem that as a good thing! – At the lower mid-price point that this machine is positioned, there will always have to be compromises in some areas to make it a commercially viable product. However, DKN have wisely invested the production costs into what really matters – high quality components put together in a well- designed and well – engineered machine. 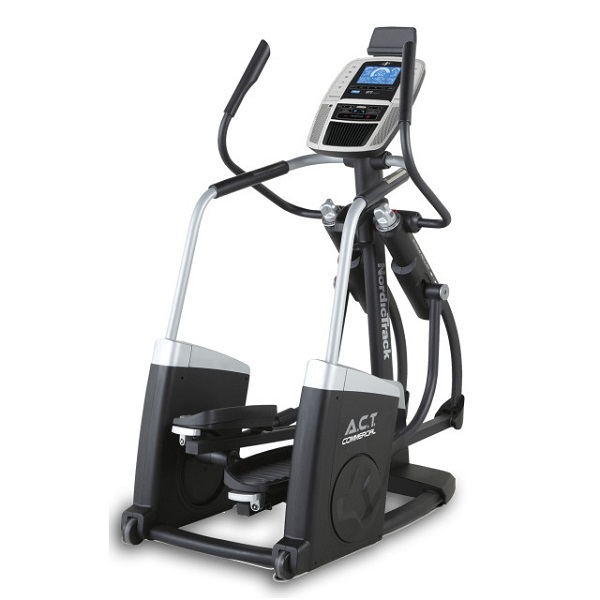 If like us, you’d value the benefits of a heavyweight flywheel and silky smooth elliptical motion more than an MP3 jack and speaker system, the XC-140i represents a very wise AND lasting investment. The DKN XC-140i is not currently available from any retailers we're aware of in the UK. A heavy flywheel, a smooth, bio-mechanically correct elliptical movement, quality components and good design make the DKN XC-140i rather special. The tablet compatible console, along with DKN Motion app put it into a league of its own. 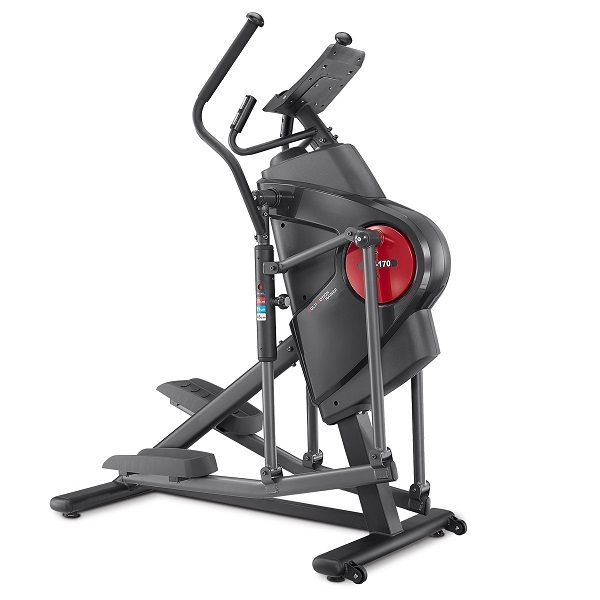 This is a hell of a lot of cross trainer for under £500 and really knocks out the competition from other rear-drive elliptical cross trainers in the market. Highly recommended but we'd also say it's worth taking a look at the new black line version with upgraded Bluetooth heart rate receiver that's just superseded this model.